Thank you Sarah for this summary of the discussion! The questions you ask about which Gaslight correlates to the idea of melodrama (or, indeed, if either do at all!) are very interesting and I have another thought to add. 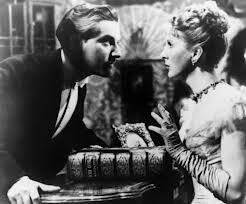 Gaslight (1944, the US version) is also part of another cycle/genre: the gothic. The gothic, just like melodrama, is equally fraught with debates over definitions, but I think it is important to consider here because several of the elements we have discussed with melodrama relate to the gothic too. The 1944 Gaslight is particularly significant because it is part of larger cycle of films released by Hollywood in the 1940s. These gothic films incorporate many of the themes and iconography of the earlier gothic literature, featuring narratives which re-work the Bluebeard tale of imperilled heroines and horrifying houses. Throughout the 1940s every major studio released films which included this gothic formula including: Rebecca (1940), Suspicion (1941), When Strangers Marry (1944), Sleep, My Love (1948), Secret Beyond the Door (1948),and, of course, Gaslight (1944). This would be an interesting point to apply to our discussion of the Gaslight films: we noted how the relationship between the wife and husband is given much more prominence and screen time in Cukor’s version and perhaps the 1940s gothic context adds another dimension to this observation. Considering the gothic formula also places more emphasis upon the representation of the house: this would open up another point for comparison between the films which we can discuss. In addition to these similarities, it is also significant to note that the gothic and melodrama are often terms used interchangeably. Indeed, Thomas Elsaesser refers to the gothic cycle of films as “Freudian feminist melodramas”: I wonder if this is a useful label to apply to our own discussion and reading of the films? Elsaesser, Thomas. 1987. “Tales of Sound and Fury: Observations on the Family Melodrama,” in Christine Gledhill (ed), Home Is Where The Heart Is: Studies In Melodrama And The Woman’s Film. London: BFI: 43-69. Hanson, Helen. 2007. Hollywood Heroines: Women in Film Noir and the Female Gothic Film. London: I B Tauris. Punter, David and Byron, Glennis. 2004. The Gothic. Oxford: Blackwell.